Jira admins, rejoice! 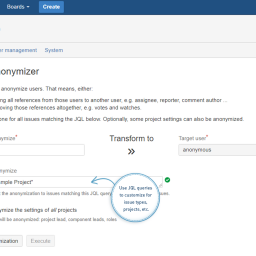 The latest release of User Anonymizer for Jira is here. And it brings two powerful new features—automated anonymization and a reporting function—that will save you time and make user anonymization easier than ever. Jira admins typically don’t enjoy repeating the same manual task over and over again. That’s why they love using helpful automation like using Jira Workflows in User Profiles for Jira. And it’s why we’ve added new automation functionality to our User Anonymizer for Jira app. With the latest release (v2.0), you’re now able to schedule and automate recurring anonymization tasks; plus, you can now export anonymization reports to assist with GDPR compliance. 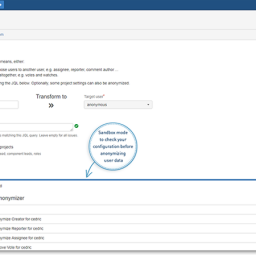 User Anonymizer for Jira gives administrators a simple, yet powerful solution for anonymizing user data across Jira issues, comments, custom fields, workflows and more. This is essential for complying with GDPR’s all-important “Right to be Forgotten.” It’s also valuable for keeping sensitive customer, employee, and business data out of the wrong hands. Many businesses recognize the importance of regularly anonymizing user data in closed issues. This helps protect trade secrets and reduce the risk of fraud and misuse. However, until now, it has been a tedious process requiring Jira admins to manually run anonymization procedures every quarter or month. User Anonymizer for Jira 2.0 solves this problem. The new release includes a built-in automation function. Now you can simply set the parameters for automation, schedule it using a CRON expression, and let the app handle the rest. This feature is helpful if your organization has established a policy to anonymize all Jira issues older than two years, for instance. A key component of GDPR is Right of Information. Basically, consumers have the right to know what personal data is stored in your systems. This means that Jira admins need a convenient way to document personal data use and share it with consumers on demand. Admins must also be prepared to document compliance with the Right to be Forgotten. The latest version of User Anonymizer simplifies both of these tasks. Now, you can use the Sandbox Mode to find all instances of a user’s personal data across your instance and quickly generate a shareable report. Likewise, you’re able to export reports for completed anonymization tasks to document your compliance with GDPR. The latest version of User Anonymizer for Jira includes powerful features that will save you time and ease GDPR compliance. Take just a few minutes now to update to version 2.0 and start enjoying the benefits of automated anonymization and the built-in reporting function. Not a customer yet? Head on over to the Atlassian Marketplace to start your free 30-day trial—and discover how much easier user anonymization is with this simple, yet powerful app.